If you haven't read my previous article then, please Read This. It will be very helpful.So many times you may have experienced this , When you sign up to join any website, they may want to verify your email address by sending confirmation link to your email address. You'll learn how this thing works in this tutorial. 1. When users sign up. We will create a random set of confirmation code. 2. Keeping the details and confirmation code in table "temp_users ". This is temporary table, we have to move this details to table "registered_users" after email address has been verified. 3. After a successful insertion of details into table "temp_users", send confirmation link to email that users used to sign up, if email is invalid they will not receive our email. 4. They have to click on confirmation link to activate their account. 1. 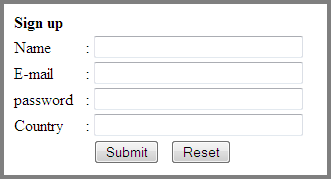 Creating table "temp_users" & "registered_users"
1. Generating random confirmation code. 2. Inserting data and confirmation code into database. 3. Sending email to user with confirmation link. 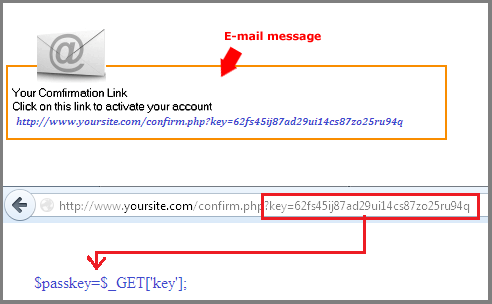 When your user open his email he'll see this message and link to file "confirm.php" including key in url. 1. Checking key from the URL. 2. If key found in database,then move all data in that row from table "temp_users" to "registered_users". 3. Delete key from table "temp_users"
//Connect to server and select database.